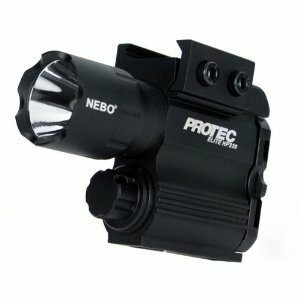 This high powered firearm LED light highly efficient, recoil-proof LED to generate 230 lumens of blinding white light. Light of this magnitude is enough to dominate an aggressor�s night adapted vision, ideal for military, law enforcement, and self-defense. The reflector lens tightly focuses the beam for long distance lighting while also producing enough light to support the user�s peripheral vision. The batteries will produce 3 hours of continuous illumination. The compact body of the HP230 is constructed of aircraft grade anodized aluminum making it a lightweight, yet powerful light source. There is also an O-ring and gasket sealed to be completely weatherproof. Also features an ambidextrous On-Off switch to provide one-finger operation. This switch allows you to select 100% white light, 50% white light or defensive strobe.